At the moment, here in Kilcoole, entering the colony is like wading through a ball pit, except the balls are chicks...and they are extremely difficult to see! Most of the chicks are going through the "terrible twos," at the moment, toddling off in every direction. 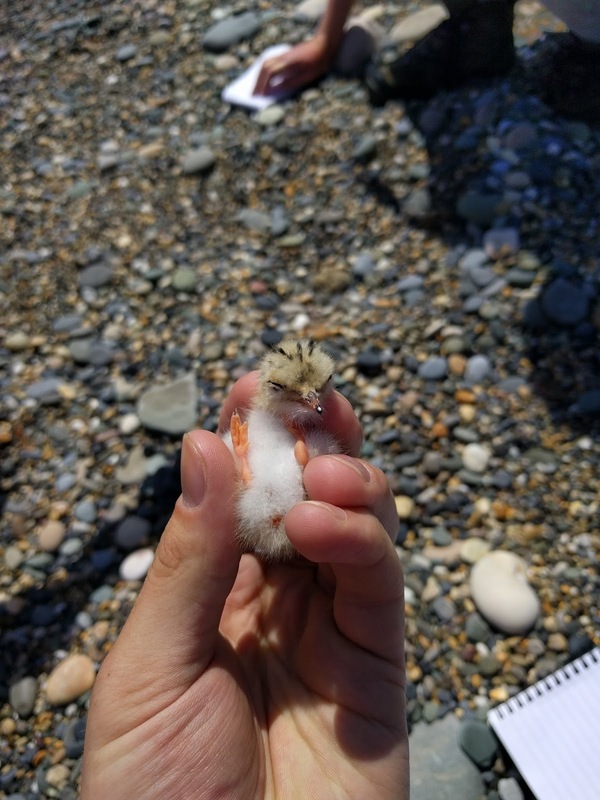 However, it's imperative we ring as many as possible as part of the Little Tern Protection Scheme, so all hands have been on deck with Andy Butler, Steve Newton and Jason Monaghan (our local NPWS Conservation Ranger) down to help catch as many chicks as possible. A relaxed, reclining youngster. Photo taken under NPWS licence, by Andrew McManus. A Little Tern chick expressing itself. Photo taken under NPWS licence, by Andrew McManus. The weather has been spectacular of late, and even factor 50 couldn't protect us from farmer's tans. The sunshine and low winds gave us the perfect opportunity to ring as many chicks as we could find within a couple of days. Any recaptured chicks were weighed (using a spring balance) and measured (using a wing rule): this information gives an insight into just how fast the chicks grow in this early stage, as they gulp down the sandeels, sprats and other prey caught by their parents. Chicks that are old and big enough are currently being fitted with colour rings. 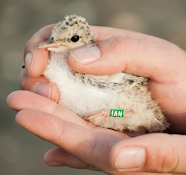 Green 'darvic' rings with three-alpha or three-alpha-numeric codes, always beginning with "I" (Ireland), are fitted to the tarsus of the leg, so that wherever they go, those Little Terns can be traced back to the Kilcoole colony. Chris assessing a chick to see if it's grown big enough for a ring. Photo by Andrew McManus. Yours truly, squatting to pick up a squatting chick. Photo by Andrew McManus. Little Tern chicks aren't the only chicks scurrying around the shingle. 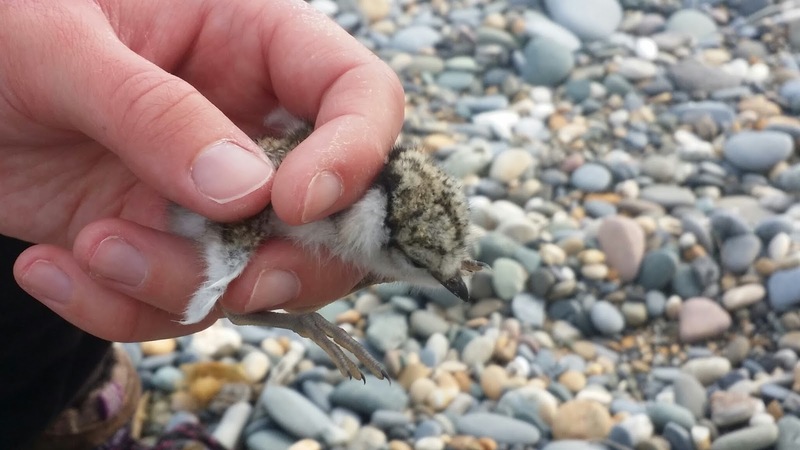 A Ringed Plover nest hatched recently, so keep an eye out for balls of cotton wool on stilts, bumbling along at surprisingly high speeds. A Ringed Plover chick. 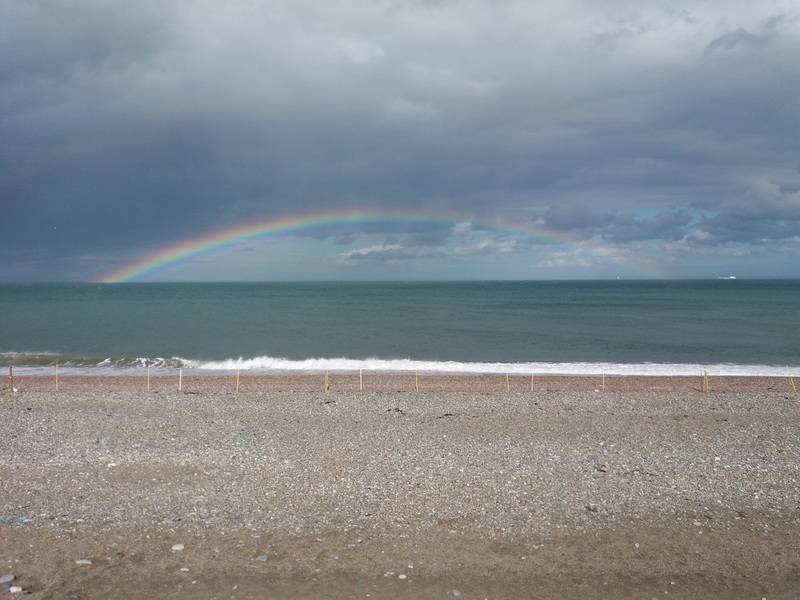 Photo taken under NPWS licence, by Jason Monaghan. We have estimated that we have over 300 Little Tern chicks this year, so the birds are doing very well so far. We continue to find new nests, with 175 discovered thus far, and more expected to be spotted over the next few days. The satellite colony now has 24 nests, and so extreme care must be taken when walking alongside it due to egg and chick camouflage. The shingle around the Breaches is a highway for chicks old enough to explore, and is best avoided. As always we greatly appreciate the enthusiasm the Kilcoole locals show for the project, and the care they express for the Little Terns. 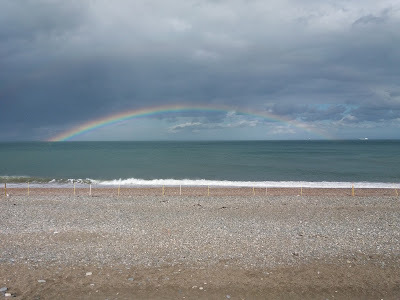 Rainbows like this are a regular sight at Kilcoole: this is one seen from the front window of the hide. (I.Sullivan).